$31.99 & FREE Shipping on orders over $59 $35. Remember your parents scaring you with "Be careful of firecrackers, they can explode in your hand!" 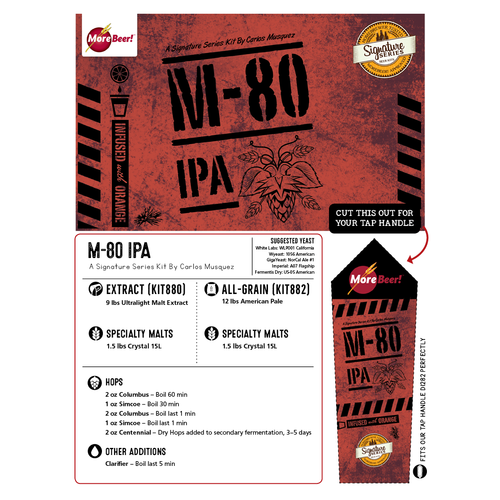 Well let us warn you right now... our new, juicy M-80 IPA is going to explode in your mouth. It's going to be crazy. Flavors going everywhere. Maybe your parents would tell you to use caution and not to make this beer. But you're grown up now, making adult decisions (most of the time), and we think you've earned the right to buy a beer kit with a fuse and a lighter. With a slight smile and a wink of the eye, we say "go ahead... have some fun". Let us tell you about the inner workings of this bomb. Sure it has big IPA malt, but you want to know about the hops. It starts with an unreasonable amount of Simcoe, Columbus, and Centennial hops. By themselves these are all explosive hops, but together they combine to bring true, huge IPA hop flavor. 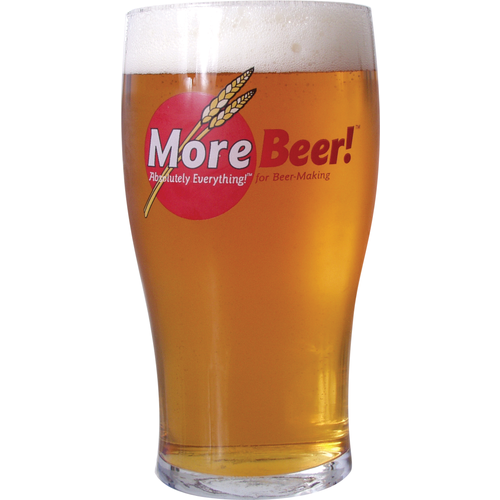 Because of the similarity of hops, one MoreBeer! staffer dubbed it a mini "Pliny The Elder... but with orange". High praise indeed. Did you just say Orange? Well done sir, good paying attention. What really sets this IPA apart from the masses is that the recipe calls for you to cut up and add three fresh oranges into the fermenter. Crazy? We thought so. But that is what we love about our Signature Series of Beer Kits, a selection of crazy, unique beers that really stand out. 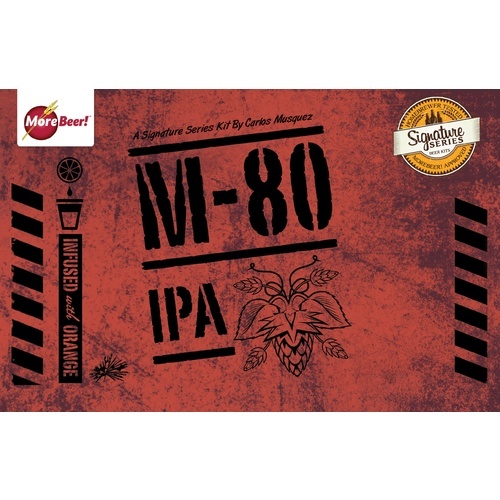 M-80 IPA was designed and created by your fellow homebrewer, Carlos Musquez. We do admit he went a little AWOL on this kit and into uncharted territory, but we love a rebel. Being a graphic designer he also designed the very cool matching bottle labels. Bring a labeled six pack to your next party and you might be dubbed "The Bomb". You will need to supply the three fresh oranges... we'd ship them to you, but they would get a little squishy. My father ordered the same beer today. We're going to brew it at the same time. It's a competition! I'm going to win. I made a couple of months back and loved it!! Loved this kit.... All my friends said this was one of the tastiest IPAs I've ever made. Well balanced with a nice citrus kick. I've brewed this a few time using the Grainfather and have had total success. I've dry hopped and added grapefruit , orange and lemon zest and without any fruit at all and it's always delicious. My favorite More Beer kit. Brewed M-80 IPA using Wyeast 1056 and used three oranges and zest exactly like directions dictated. I soaked the oranges and zest in vodka for an hour or so and added to secondary for two weeks. After bottling I waited a couple of weeks before tasting as directed and I truly love this beer. The added sweetness of the oranges balances the bitterness of the hops and zest perfectly in my opinion. This is by far one of my favorite IPA's I have brewed. This is one of the best beer kit I've ever made, my friends loved it. I didn't expect too much from this kit due to the price but it turned out to be one of the best I've ever brewed or tasted. I used grapefruit and orange peel but only about an ounce of each. Will use more on the next two batches of M-80 currently fermenting. If you like hoppy IPA's, this is a great kit. This was wonderfully citrusy and piney. I used canned mandarin oranges in their own juice (pasteurized, no sanitation issues) and it turned out great. Just different enough from other IPAs I have made. Will definitely make again. While the citrus taste and smell did not come through very well for me, this is a fantastic American IPA. Tons of hops flavor and a grain bill that matches it well. Love this IPA! I am giving this 5 stars because I would not change the grain and hop bill. I used grapefruit instead of oranges. I thought that I ruined the beer at first, it was grapefruit acid bitter at first. But the bitterness subsided to a nice grapefruit dryness. Unique beer. I am going to brew it again tonight but will use the oranges or high quality orange juice (for quick convenience). GREAT IPA...ESPECIALLY FOR WARMER SEASONS. Just kegged this last week and it has turned out to be a great IPA! The oranges and orange zest definitely contribute to the bitterness and flavor. The only change I would make would be to dry hop with some citra or something similar. Loved the hop bitterness but it could have used just a bit more aroma to put it into the amazing category. Also, I had a substantial amount of trub even after cold crashing for a week. I had a little over 5 gallons in the primary but ended up with a little over 4 gallons in the keg. I'll probably brew this again with some minor changes. Great kit! I used 1 Large Grapefruit & 1 Orange and it turned out great. If you love IPA's get this beer! Don't be afraid to depart the pattern! M-80 is a great starting point! I swapped a 1/4 grapefruit for an orange conservatively. Should have put the whole thing in. With a healthy dose of oak chips it turned out great. -Morebeer we need more kits like this. Couldn't be happier with this one!! This beer is fantastic, very well rounded and the flavor is perfect. I used fresh blood oranges off our tree and it did not disappoint! I will definitely brew this one again soon! Did the same. It adds just a little "umph" to make it that much better! This may be the best beer I've brewed yet. Nailed all of the details(mash temp, ferm. temp, OG, etc.) and it's the first batch I have kegged. It's awesome! Used three oranges just like it says, except I soaked them in a little vodka overnight and dumped the whole thing in. I will definitely get this one again. Don't skip the oranges! Bitter and hoppy, yum! I've been waiting for a review on this one... why not a "5" ?